Cleaning the print head to a dry and stuffy - Several types of new models of printers equipped with facilities Cleaning system. Try doing this with an innate facility that is by doing a printer test repeatedly. Or there is also equipped with facilities to clean the head (cleening head). This facility can be used to clean the head. This method is only useful if the blockage in the head not too severe. Usually for a stuffy head padah this way are rarely successful. And if the head cleaning process using the facility you repeatedly do perhaps 15 to 20 times then it will lead to wasteful ink. Or could even lead to "Waste ink tank full" so it needs to be reset. Other way is to just replace Cartidge. This can be done if Cartidge and head together. This method is quick and easy, but it cost us a hefty spend. Just imagine if these events often you want to save alami.Boro-boro. I only recommend this for the last choice. And this last one of the ways that we can try. We try to clean its own printer head. That is by soaking or enter the printer head into the liquid water / alcohol or ammoniac may be added into it (remember that fed into the liquid is only part of his head, not all of them). 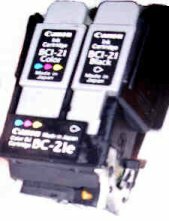 Or if you need to buy a special liquid to clean the printer head to dry it (cartridge flush solution), but also the price is pretty fluid. Please do this step about 10 minutes or all day if necessary, also no problem. This step can mencirkan again dried ink. With the melting of the dry ink is expected to print with good again.